The essential fatty acids were given their name when researchers found that they are essential to normal growth in young children and animals. A small amount of Omega-3 in the diet enabled normal growth, and increasing the amount had little to no additional effect on growth. Omega-3 plays several important roles in vision and nervous system function. The phospholipids of the brain’s gray matter contain high proportios of DHA, indicating they are important to central nervous system function. Brain DHA content may be particularly important, since animal studies have shown that depletion of DHA in the brain can result in Learning deficits. Omega 3 have been found to be especially useful for children finding it more difficult to focus and to complete their schoolwork. Fish oils appear to offer a safe efficacious treatment option for educational and behavioral problems and to reduce attention deficit and hyperactivity disorders-related symptoms in some children. 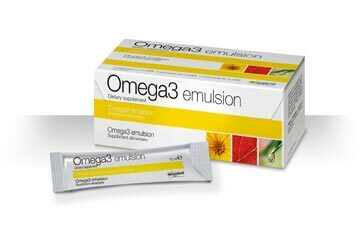 This emulsion is formulated to encourage children to take their fish oil supplement regularly and happily thus securing their daily intake of omega 3 fatty acids. It offers a unique and convenient delivery system for omega 3 with its delicious lemon flavour.